My quest to obtain and record information about our family began on a cool November day in 1965. I was on leave from the United States Air Force and visiting my parents at their home in Philadelphia, on route to a tour of duty in the Philippine Islands. As a child, I had frequently heard my father talk about the Sunday afternoon walks he and some of his cousins took to the homes of two of his father's sisters, Aunt Maggie McKenna and Aunt Rose Yeakel. Dad's vivid accounts of the visits conjured up Norman Rockwell like images of these family, fun and food filled excursions. Since Aunt Rose was 75 years old and the last of her generation, I suggested to Dad that we visit her. Along with my wife Lee, we made the 15 minute drive to her home which was located high in the hills of Bala Cynwyd above the west bank of the Schuylkill River, just outside of Philadelphia. When we arrived, we were greeted by Aunt Rose who was sitting in her chair on the front porch of her brick home. She had a blanket over her shoulders and another over her lap. Her spirits and her mind were as crisp and sharp as the cool November air. Lee took notes as Aunt Rose talked. She talked about her life as a young girl in Scotland, about the ocean voyage to America and about her father. She recalled that her father Patrick Tinneny had been born on a farm someplace in Ireland. She said that in his youth he had gone to Greenock, Scotland where he found work in a sugar refinery. 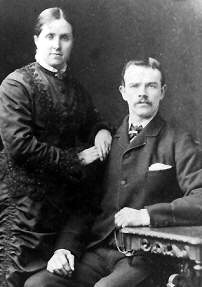 It was in Greenock that he met and married her mother Margaret Malloy. Margaret was the daughter of Irish parents who lived in Greenock. She told of having nine brothers and sisters. Except for a brother Francis, who died as a child and is buried in Greenock, all of her brothers and sisters came to America. She remembered that the family lived on Shaw Street in Greenock and that they were members of Saint Mary's Catholic Parish. She went on to recount how, in the late 1800s, her father had made several trips to America (Philadelphia), where he worked as a laborer and eventually earned enough money to pay for the passage of his family to America. As a result of these trips to the States she said that his friends back home in Greenock nicknamed him "Yankee Pat". Photo: Patrick and Margaret Tinneny. Aunt Rose knew little about her father's family. She remembered hearing that he was one of 14 children of John Tinneny and Margaret McAdam. She thought that he was raised on a farm, possibly in County Limerick, and that his mother had counts and earls in her family. She remembered hearing that her father had studied music, the violin, in Heidelburg, Germany and that a member of her mother's family had invented the paving process that has come to be known as the Macadam road. In the course of the many years that have passed since that November afternoon, I have been able to clarify and to significantly expand on the limited but very important information provided by Aunt Rose. That information enabled me to trace and to learn more about Patrick's descendants here in America. More exciting, however, was that the information provided the key which enabled me to open the doors that led to learning about and reuniting with previously unknown branches of the family. Reunions with cousins in America, Canada, Ireland, England, New Zealand, Scotland, and India. For me, the high points of this effort have been the personal meetings both here and abroad of members of our family who had been separated by many generations. My original objective was to publish a family history in book format, however, I have realized that there are only so many hours in a lifetime and that perfection can be the enemy of progress. With that in mind, the advances in technology and with the assistance of our cousin Lucy Sherwood in England I have decided that now is the time to begin making the information that I have gathered broadly available to our family members and others via publication on the Internet. The greatest benefit of doing it this way now is that it will allow the information to be distributed without cost to our family, whereas the cost of publishing a printed book would be expensive to the point of precluding some from being able to obtain the information. Having said that I do intend someday to do the paper format in some manner. Hopefully, this effort, although incomplete and ongoing, will motivate and facilitate others of our family, now and in the future, in America and abroad, to capture, to document, and to share additional family history information. Finally, I remain eager and willing to receive and to disburse that information.